The way to introduce fishing to a newcomer is from shore or by wading in a shallow stream or river. There is simple joy in walking up to a stream or small river, finding a comfortable spot on the bank or a boulder, casting out into the current, and catching a fish. 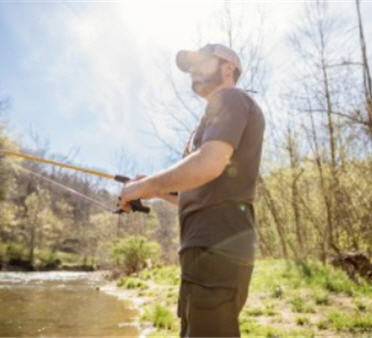 Especially if the new angler is a youngster with a limited attention span, fishing from shore can be instantly diverted into hiking, nature exploration, or a dozen other activities. If the action is slow and there’s nothing else to do, that can lead to a negative experience for the newbie which will make it harder to get them to join you the next time. When it comes to getting the right tackle for shore fishing, start simple. Begin with a simple spin casting fishing rod and reel. That’s the one where you push the button on the reel and hold it in. Then as you swing the rod forward, let the button go to allow the line to come out. To begin the retrieve, just start to reel, turning the handle away from you. This kind of rod and reel combo is the simplest to learn and has the least issues with tangles. Many of these come already spooled with moderate weight fishing line like 8-pound or 6-pound test. That’s what you’re looking for—it’s fine enough not to spook fish, heavy enough to give you a fair chance to pull free if you get snagged. about circle hooks is that they do not require a standard hard, hook set and simply cranking down and applying steady pressure works best. 2. A selection of split shot fishing sinkers of several sizes like the Bass Pro Shops Reusable Split Shot Weight Assortment. Split shots are one of the most well-known and frequently used fishing sinkers. They feature a groove that runs the full length of the sinker. This opening holds the line once the sinker is pinched in place. Split shots are often used with live-bait offerings. Adding a split shot above a hook with a worm suspended below a bobber has been a combination that has caught thousands of fish and introduced just as many young anglers to fishing. Float fishing can be an effective tactic for various species of fish and wise anglers will always carry a few fishing floats. Make sure you also carry plenty of bobber stops when using slip floats. Also, if you fish at night or during low light conditions, consider buying a few lighted fishing bobbers like Mr. Crappie by Betts Flo-Glo Lighted Bobbers and carry some spare batteries for the units too. 4. A few small “in-line” spinnerbait from about 2-4 inches long overall. You’ll find these in popular brand names like Mepps and Rooster Tail. They work great for all kinds of fish, which is what you want. The versatile inline spinnerbait is used in many types of water. Their spinning blades are irresistible to fish and using them on a river requires a speedy retrieve. Match your spinner to the water conditions—gold, silver, and copper work well in clear water with ample sun, while painted blades do damage in darker conditions—and match up spinner size to the fish you’re targeting. We recommend as a starter set for beginners, a gold and silver blade in a number three size, as well as a black and yellow blade, and bucktail. These patterns have consistently been effective throughout the years. 5. A few round head jigs in 1/16, 1/8, ¼, ½ ounce sizes and some plastic curly tail fishing grubs like the Uncle Buck’s Panfish Creatures to go on them. The most famous brand of tails are Mister Twister. Best all-around colors are chartreuse, yellow, and white. With this little bit of tackle, you’ll have a good chance of catching fish any time you’re shore fishing.